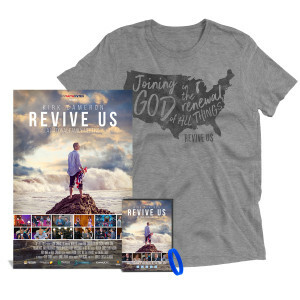 This great value bundles Kirk Cameron's Revive Us DVD, the new 'Revive Us' official t-shirt in gray, a signed limited edition Revive Us poster, and a blue 'Time to Pray' rubber wristband. Commemorate the Revive Us live event held in Chicago in October 2016 with this exclusive merchandise bundle. Learn how we can come together as a nation with faith, hope and optimism during dark times. Features special guests Dr. Ben Carson, Pastor Francis Chan, Eric Metaxas and more. Click here to purchase the Revive Us DVD separately, or view all bundle options on the Storefront. Revive Us Now Available on DVD! We are calling for a NATIONAL FAMILY MEETING. It's called "REVIVE US." Now available on DVD to bring into your homes to share with your family and friends. Where is our country heading...and what can we as Christians do to help set the right course of direction? Nearing a pivotal marker in our nation's history, Kirk Cameron realized: God has given His children a timeless message for such a time as this. Featuring reaching, worship, prayer, and thoughtful discussion, Revive Us challenges believers to faithfully lead the way. Kirk turns to Scripture to offer encouragement, reminding us there is still hope for our great nation. The time is at hand for God to Revive Us. This film also features Jennifer Rothchild, Dr. Ben Carson, Eric Metaxas, Francis Chan, and Miss Clara (War Room). The time is at hand for God to REVIVE US. We know this to be true: when OUR FAMILY gets together--and the Spirit of God is moving--WE ARE UNSTOPPABLE! Copyright © 2019 All Rights Reserved. Musictoday II, LLC, is the seller of all Revive Us merchandise and is solely responsible for all aspects of your purchase.